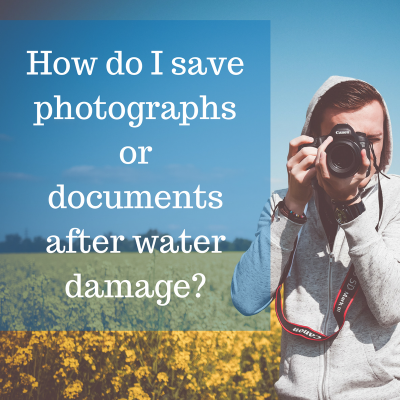 How do I save photographs or other important documents after water damage? If you have photographs or documents which have sustained water damage, the first thing you want to do is to stabilize them. This will allow you time to decide on your next course of action. One thing you can do is place them in a freezer bag and put them in the freezer. Sounds weird, we know! What you’re doing by placing them in the freezer is slowing down the paper degradation process. The main thing to remember is that if you call us immediately you significantly increase your chances of preserving all of those precious memories! Once we pick up the items, we will evaluate the extent of the damage and determine the best method for restoring them. Due to the photo finishing process, photographs are especially delicate and that makes them tricky to work with. Just as with document restoration, time is of the essence to improve the chances of saving them. Pictures printed at home on lower quality stock can make photo restoration more difficult. You will have a better chance of restoring pictures that are professionally printed because those will be on higher quality (thicker) printing paper.